Come visit Amy's Farm for an array of pumpkins for sale. 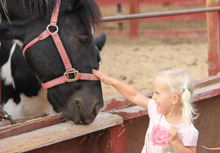 Take a walking tour of the farm and visit our animals. Shop for fresh, organic fruits and veggies in our Produce Stand. Enjoy the fall season at Amy's Farm! No need for reservations to drop in and shop. Our pumpkin patch is open Monday-Saturday 9am-5pm.